I had another rather busy week in which I had the pleasure of attending 7 engagements which varied from giving out certificates at the Citizens 4 Good Awards evening to attending the intriguing Clarence House Art Exhibition. It is always a pleasure to give a guided tour of our splendid Bootle Town Hall and Tuesday was no different. 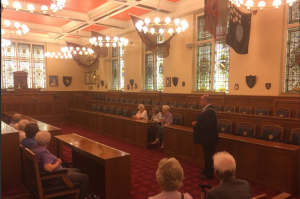 Group tours our always an honour to do as it gives me the opportunity to show how proud I am of being the Mayor of Sefton and show off this fascinating building with all its history. 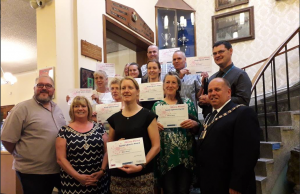 I and the Mayoress always look forward to awards events as it gives us the opportunity to show everyone how proud we are of all of their hard work and dedication as well as to celebrate with them as well. I had the honour of giving out both the School of the year as well as the Female Sports Personality of the Year. It also gives us the opportunity to get to know how much work goes into these award nights and how much work the nominees put in, it’s a fantastic way for me and the Mayoress to congratulate and show recognition of all of the effort which takes place in the community. The Citizens 4 Good awards is a program ran by Sefton4Good and my Mayoral Office in which all the ‘unsung’ heroes of the community who don’t get much recognition for all their hard work for charities or even just by helping someone out on their own accord. This is again a fantastic opportunity for me and the Mayoress to congratulate and celebrate with all of the nominees for all of their unseen hard work and dedication to all of the charities or even just for helping out massively within the community. The Bedford Primary Finale Show has been an engagement I have been looking forward to ever since I attended my first show a couple of years ago as the Primary School is such a great family orientated place and it was with great pleasure to attend this year’s Bedford Primary Finale Show. The Bedford Primary Finale Show sums up the general togetherness and ‘family feeling’ which gives you so much warmth when doing an engagement associated with Bedford Primary School. Clarence House is a charity which aims to be the voice of the voiceless working with underprivileged and disadvantaged people of all ages. The art exhibition gave some of the students the opportunity to express themselves and show people what they are made of. However it was tainted with some sadness this engagement as due to low pupil numbers this school will unfortunately be closing in the next few months. It was with great pride that I accepted the invitation of coming along to the 75th Anniversary of Sefton Sea Cadets and I was pleasantly surprised when they gave me the opportunity to open the ceremony. The day was celebrating the 75 years that volunteers have been supporting young people in the community. Events such as Dragon Boat Racing as well as Cadet Drill Formation Teams also took place during the day.